At least 12 people died when a severe thunderstorm hit the Russian capital Moscow, health officials say. Hundreds of trees were toppled by the storm, and more than 120 people sought medical help. 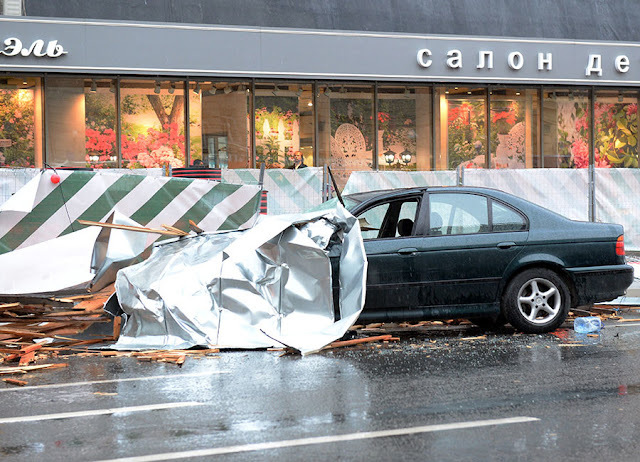 Reports say that electrical cables were damaged as Moscow was lashed with high winds, hail and torrential rain. It is the deadliest storm in the city for more than 100 years. The city's investigative committee said that "hurricane winds" had caused trees to fall in various parts of the city, killing five pedestrians. An elderly man was also killed at a bus stop, it said. TASS news agency says that 120 people have been injured. Two people were killed after a tree fell onto their summer house, Interfax reported. Delays had been reported on some metro lines but normal service appears to have resumed. Moscow's Mayor, Sergei Sobyanin tweeted: "My condolences to the friends and family of those killed." Photos circulating on social media show fallen trees blocking roads and a large roadside advertising board crushing parked cars. A video also shows strong winds tearing apart the roof of a covered tennis centre in Zhulebino district.